Home » Blog » Made in Tahoe » A Glowing Success. Tahoe Candle. A Glowing Success. Tahoe Candle. In 1996, Craig Davies came to Lake Tahoe to snowboard. While he was delivering pizzas, he started making candles and selling them at craft shows. Tahoe Candle soon became a burning success. 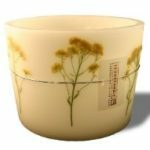 Today, Tahoe Candle is a small company producing high quality candles and luminaries, made from the finest ingredients available with unmatched craftsmanship. Only waxes that are classified as food grade materials are used. All wicks are made of 100% cotton and do not contain lead. 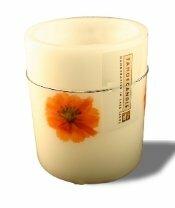 Each luminary comes with two glass holders and two unscented votives. All of the candles are inspired by nature. Many use real native flowers and plants that are pressed, dried and sealed in bees wax. 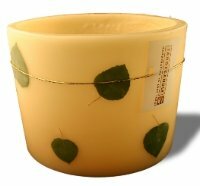 Like the Spring Aspen Candle (pictured above) made of real spring aspen leaves, and the Wild Basket of Gold and Orange Cosmo that include real flowers. There are even a few with animals and Tahoe specific landscapes such as Mountain Scene, Tahoe Cabin, Pine Tree, Black Bear and Dragonfly. 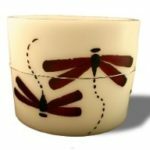 The Dragonfly candles are painted with bees wax by hand so that no two are ever alike. And, you get to choose the dragonfly color! You can place orders online on Facebook or their store in Truckee.